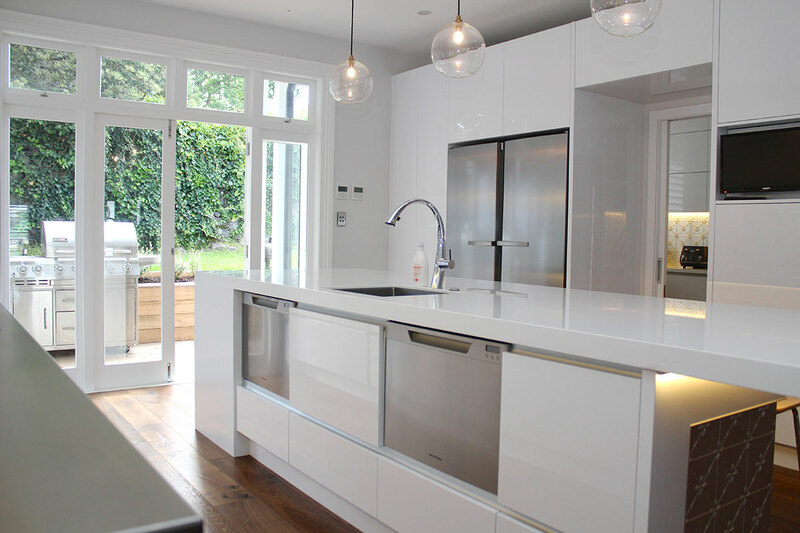 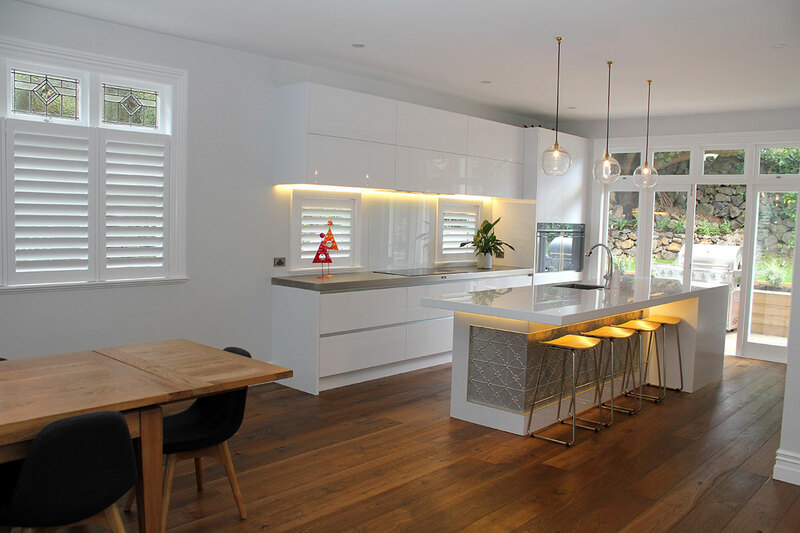 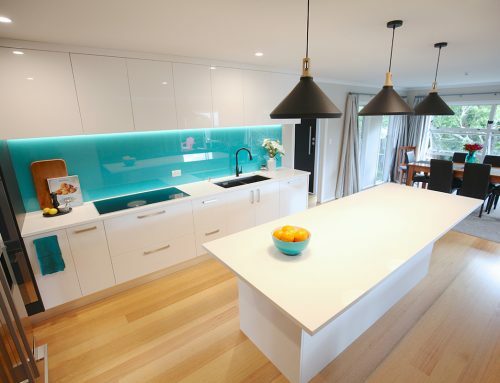 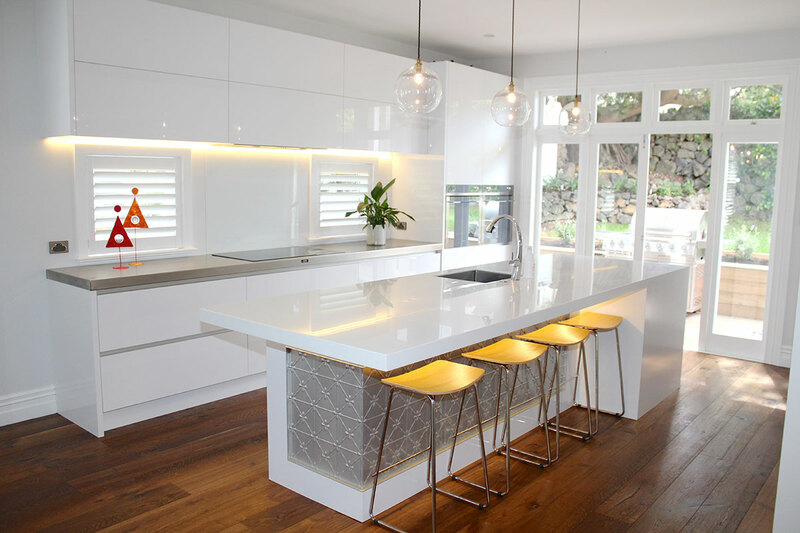 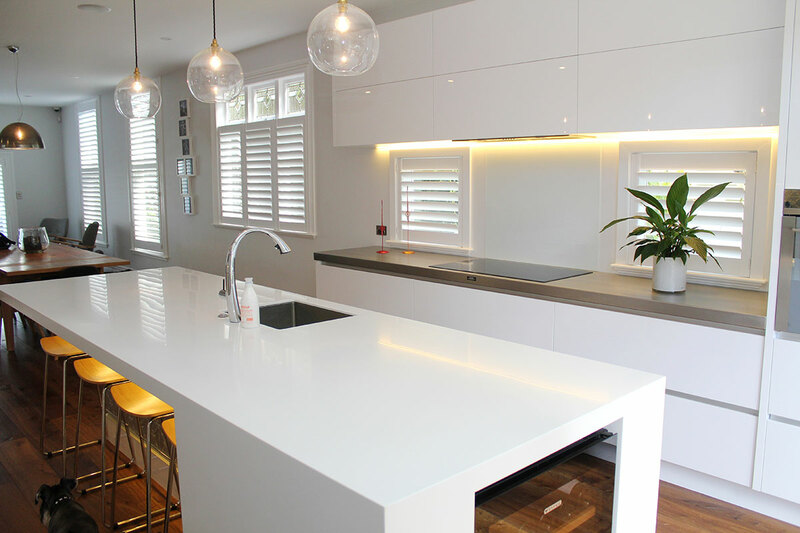 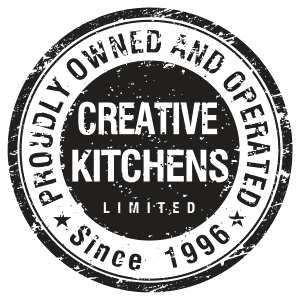 This elegant kitchen remodel by Creative Kitchens was undertaken as part of a major renovation in Auckland’s Mt Eden recently. 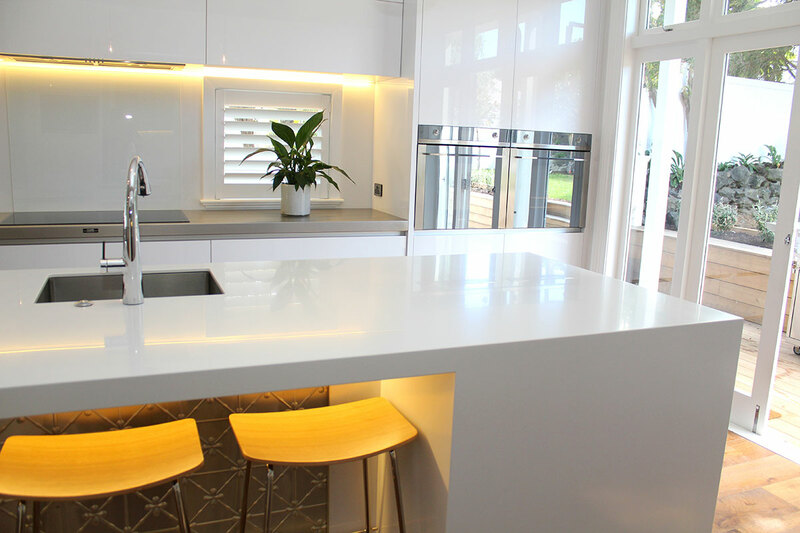 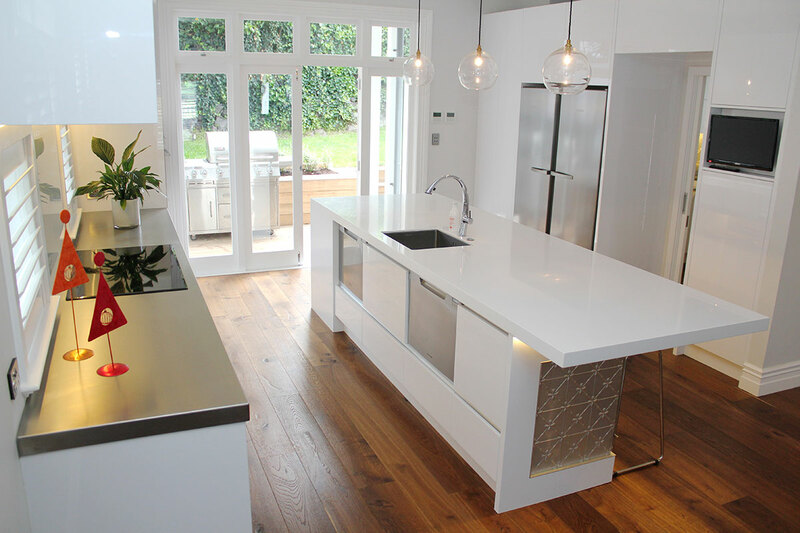 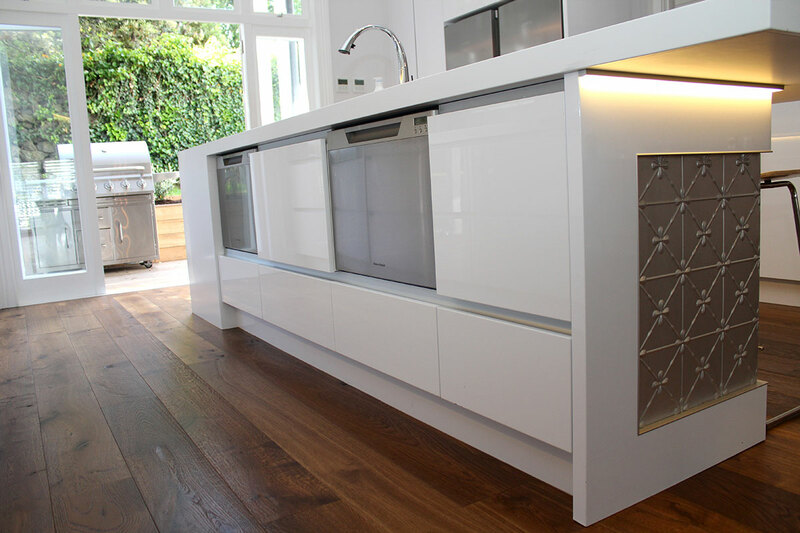 It was constructed using Dezignatek Gloss White Acrylic panels and incorporated a contemporary island benchtop, with Corian waterfall ends. 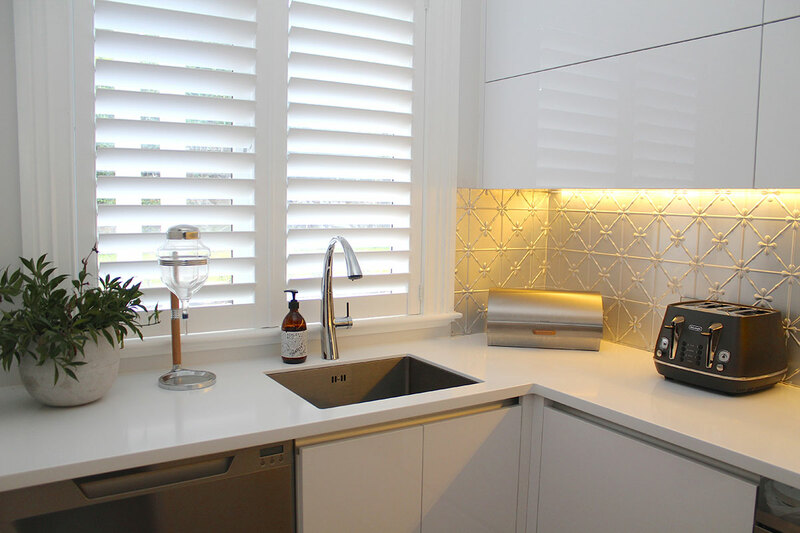 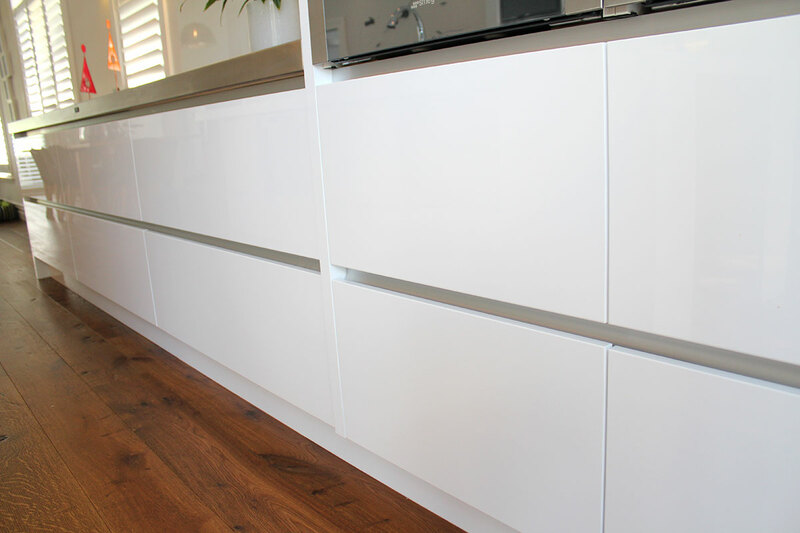 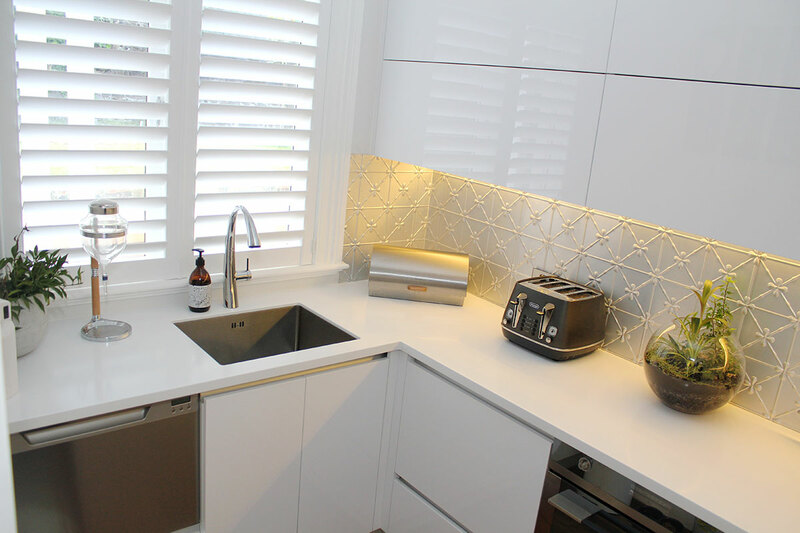 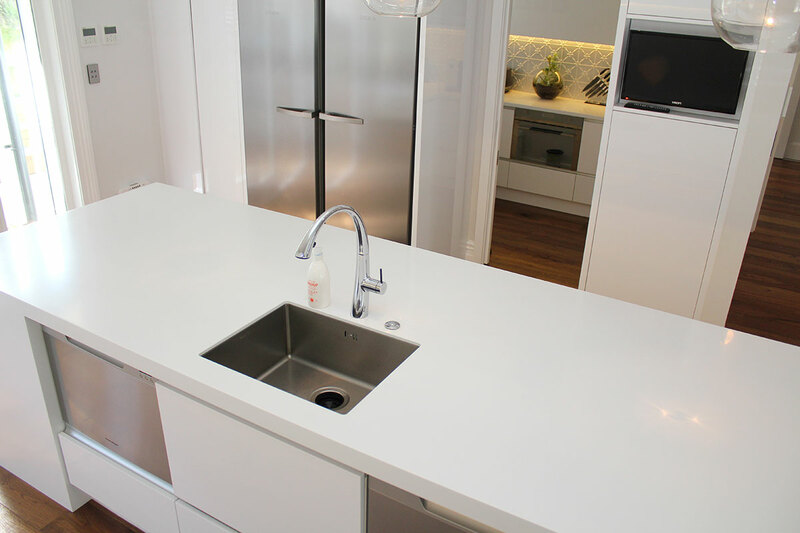 For those new to the trend, “waterfall ends” are where the same benchtop material cascades down the side(s) of a benchtop down to the floor; a very popular kitchen design element which offers practical advantages and an eye-pleasing look. 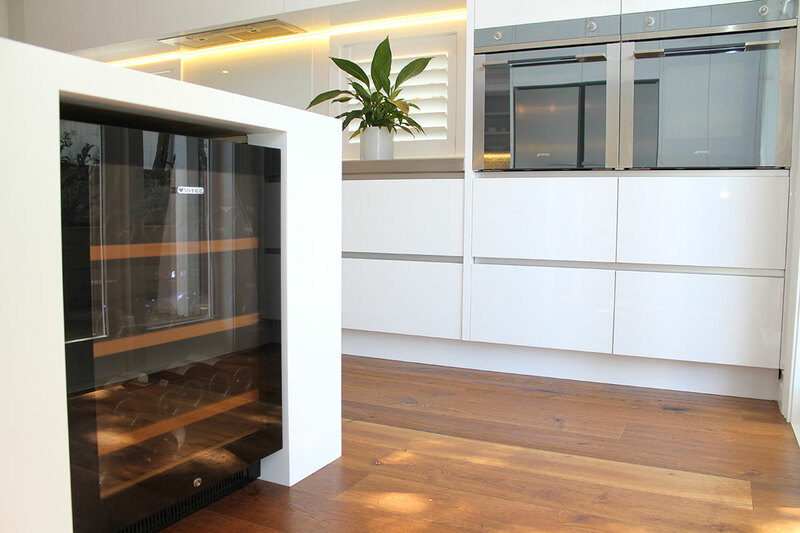 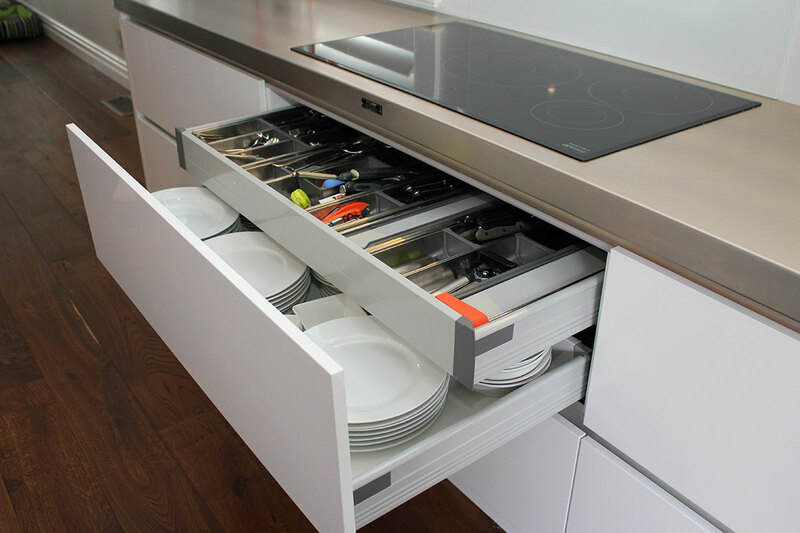 All cabinetry hardware is Blum: runners, hinges and electric Servo-Drive lift ups. 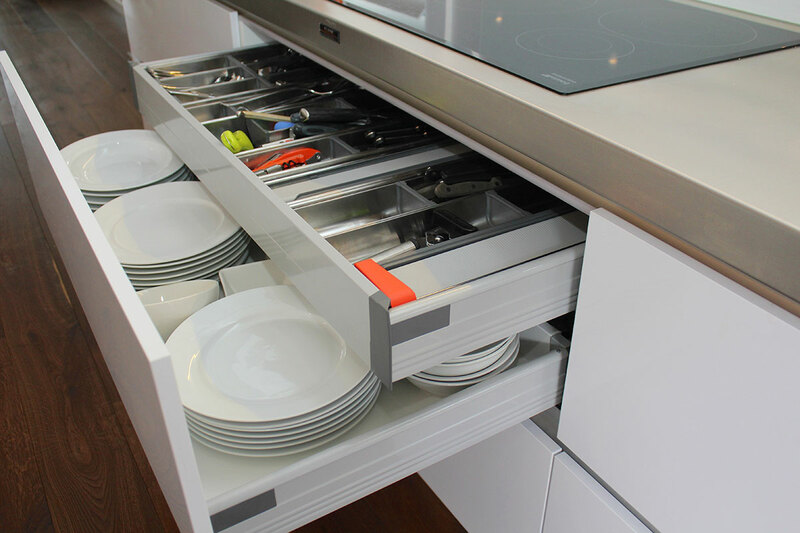 Blum’s Servo-Drive system makes opening and closing your kitchen cabinetry fascinatingly simple: A single touch suffices, and your cabinets and drawers seem to open by themselves. 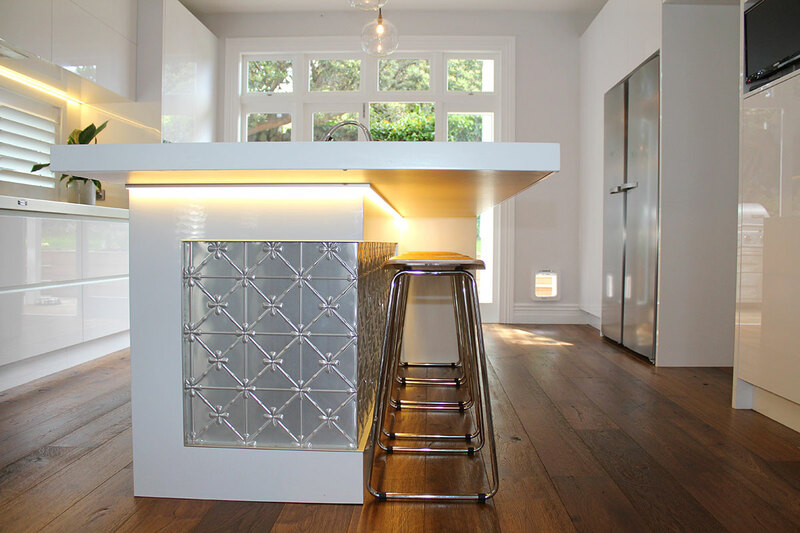 BLUMOTION ensures silent and effortless closing. 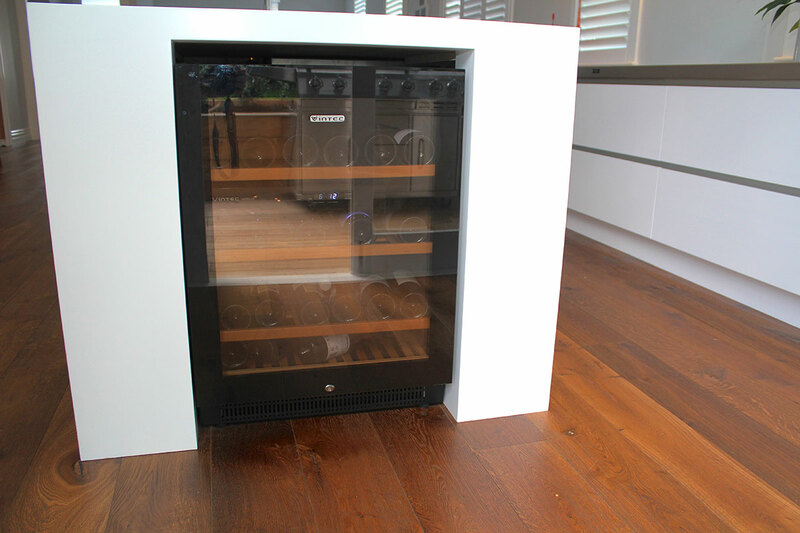 And of course, manual operation is fully operational in the event of power failure. 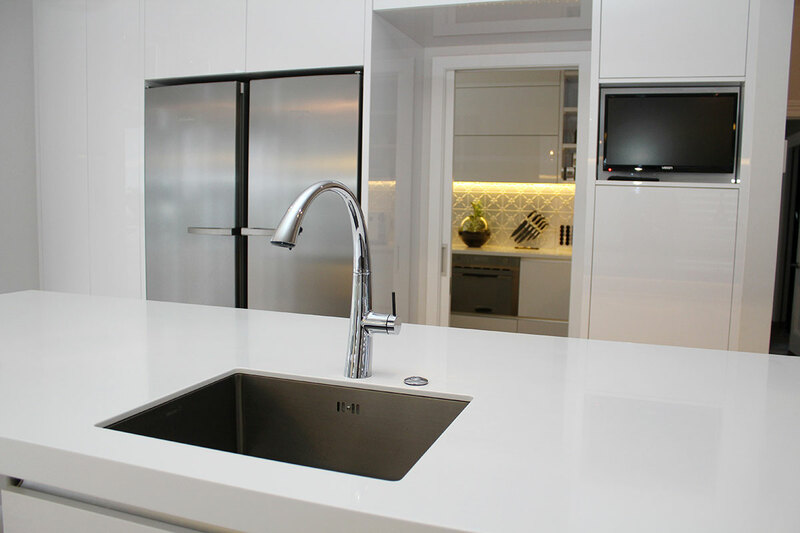 The Hob top is Linen stainless steel. 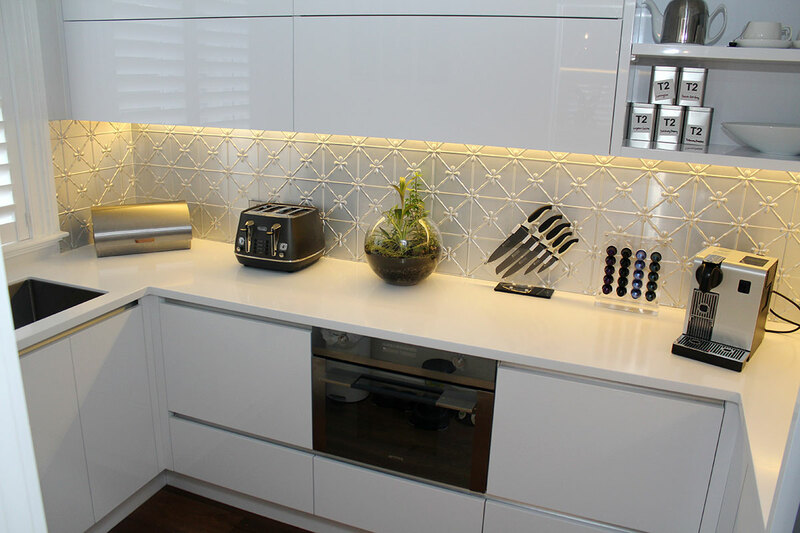 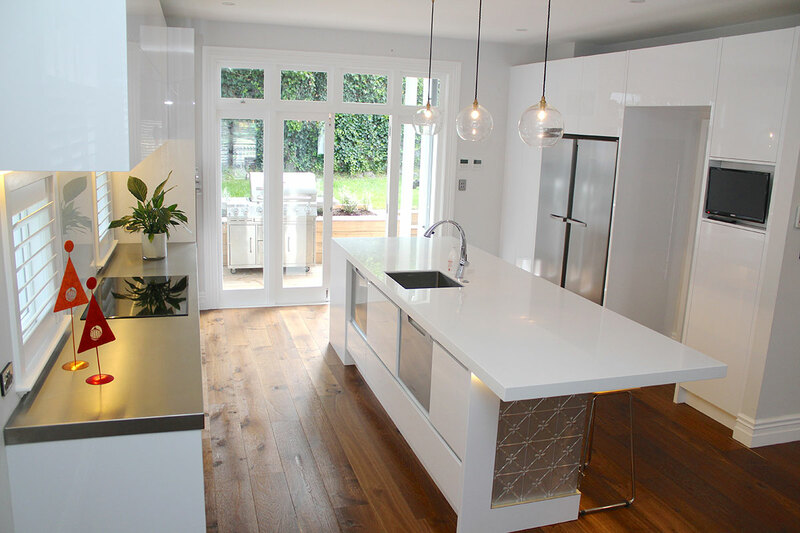 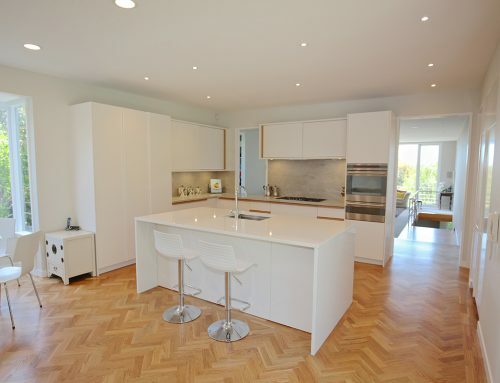 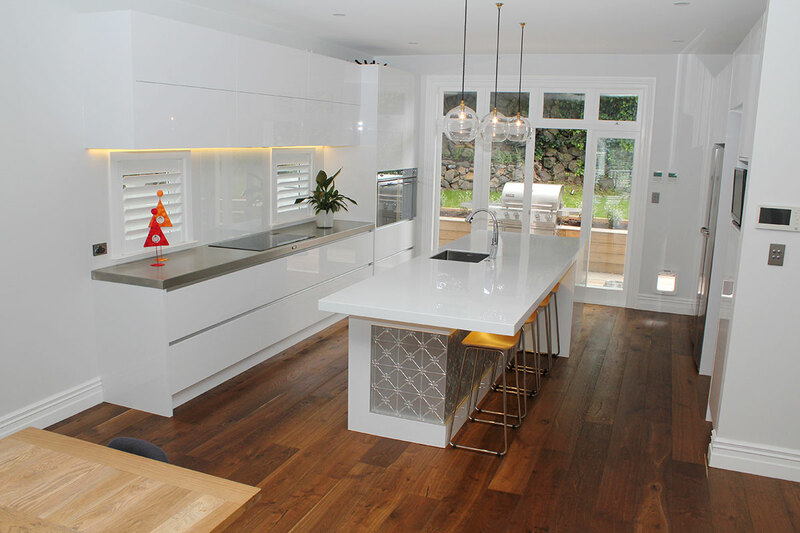 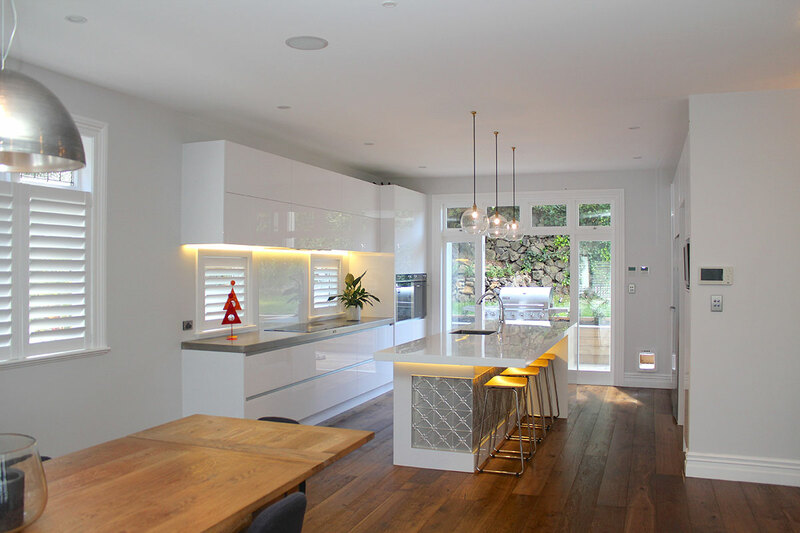 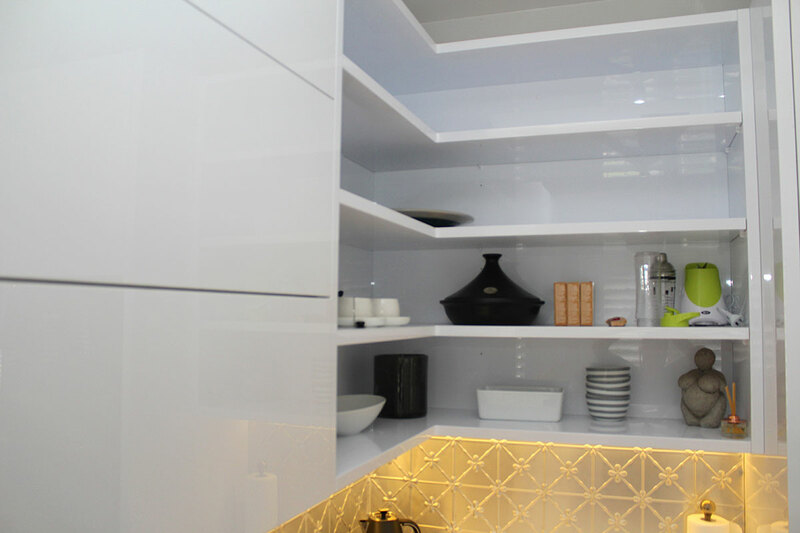 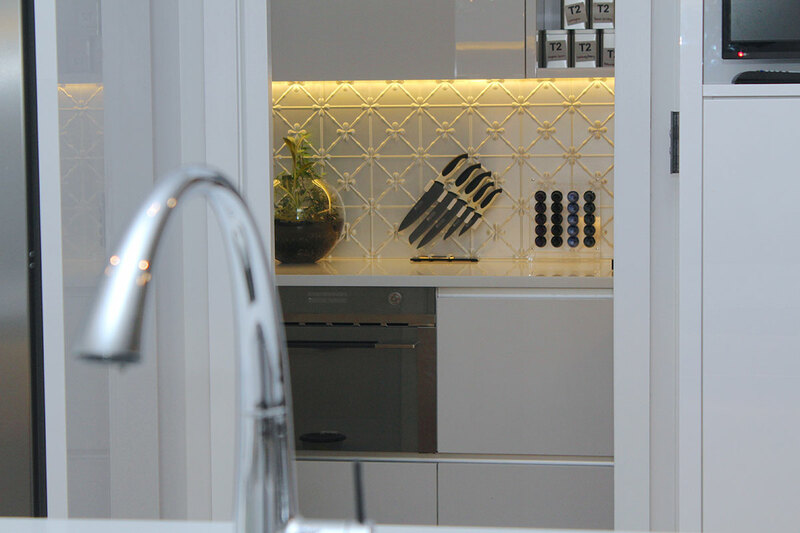 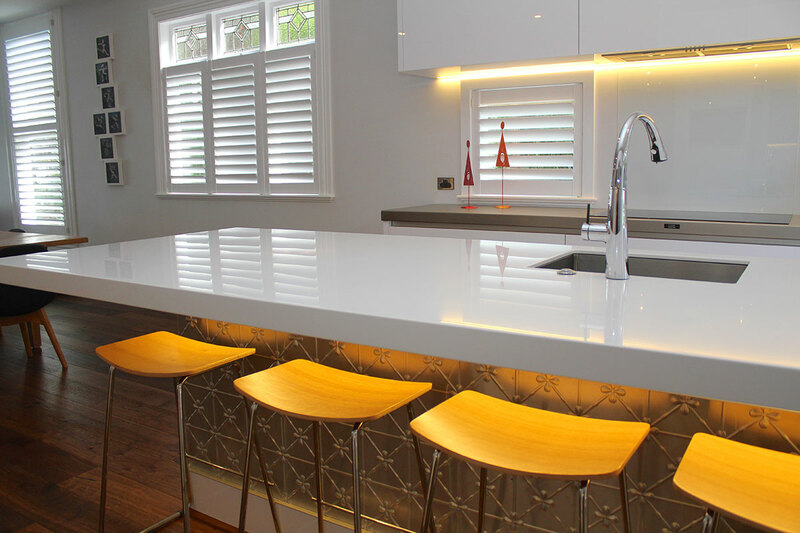 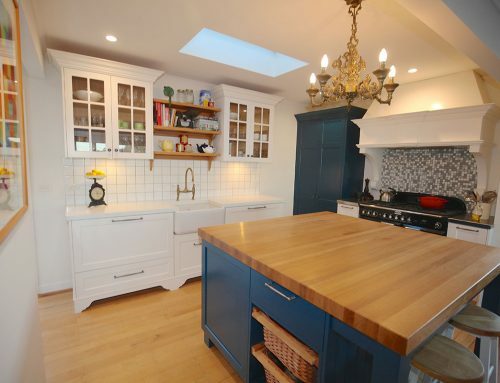 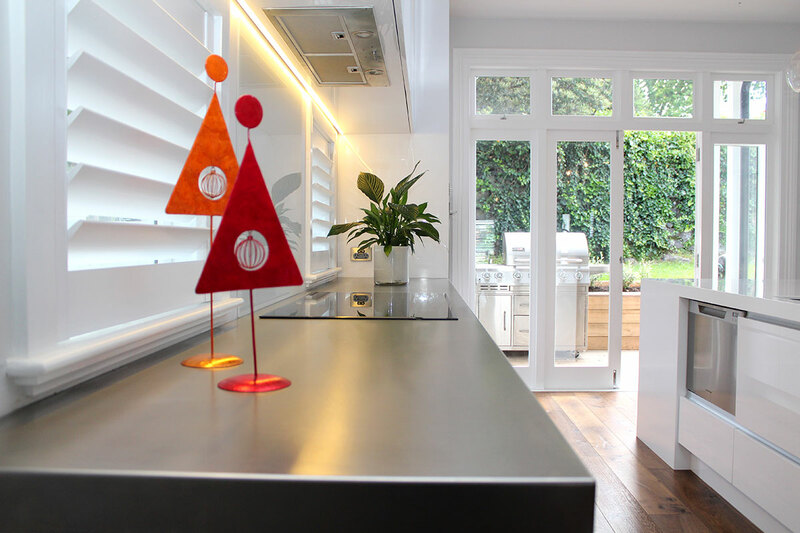 The kitchen was finished with strip lighting by Bright Lite to illuminate overheads and vanities. 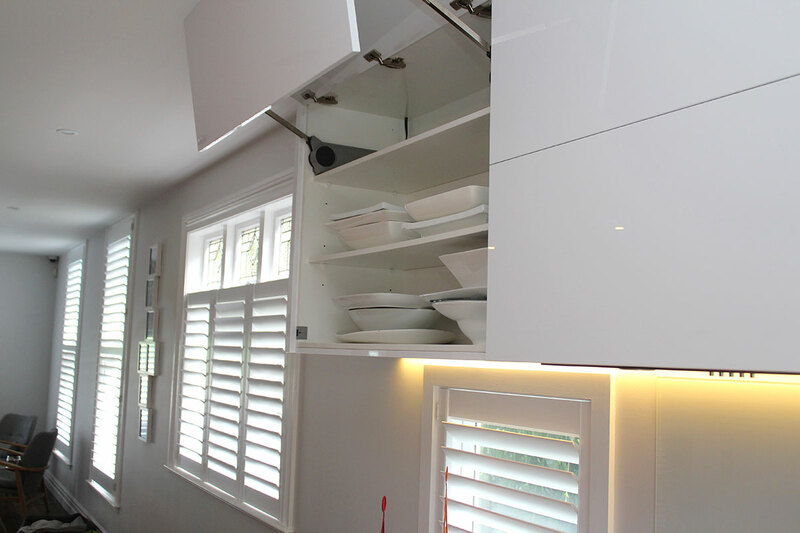 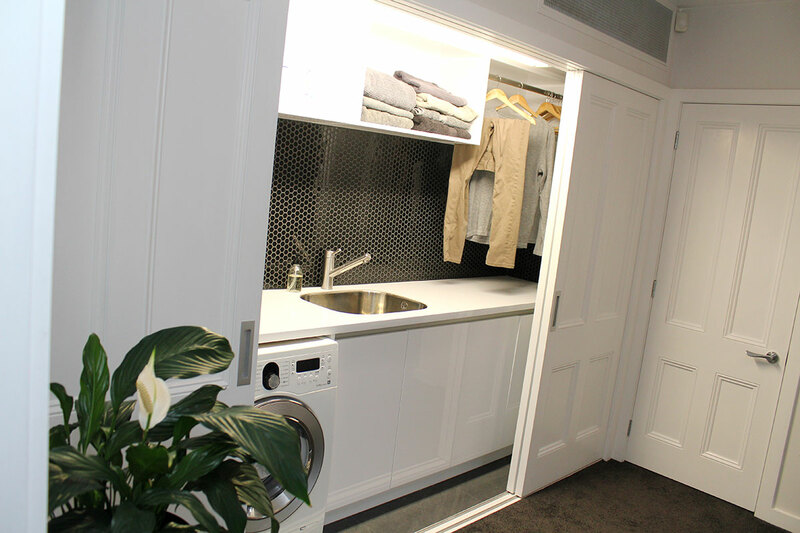 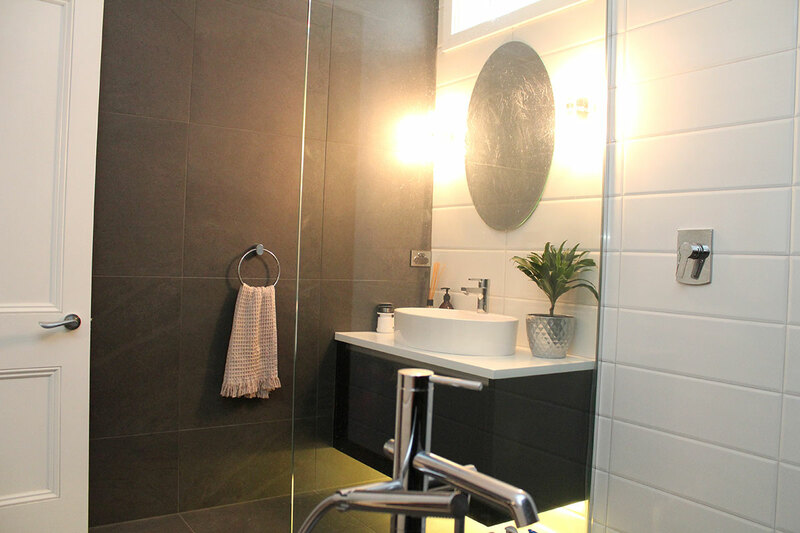 Creative Kitchens were also charged with the renovation of bathroom and wardrobe components. 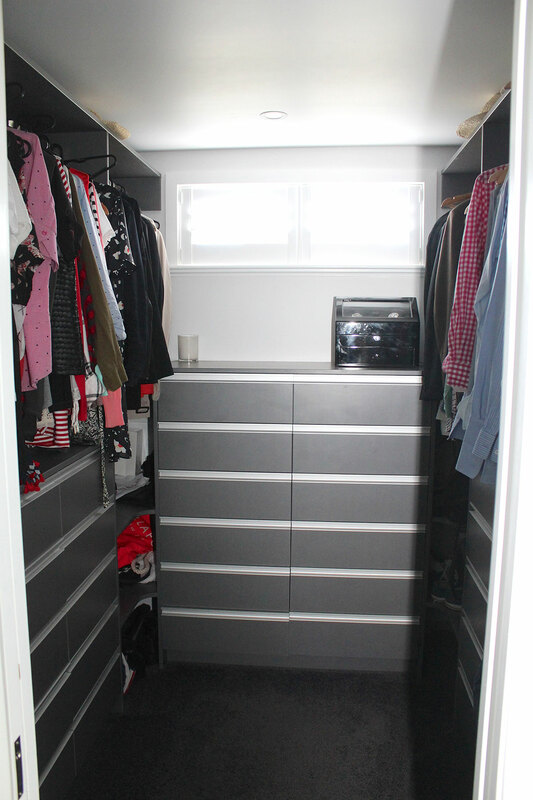 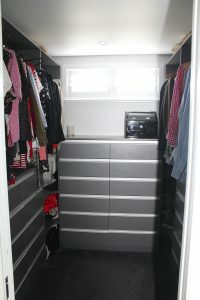 The wardrobes we done using Colourboard with aluminium strip handles for a classy, flush-line look. 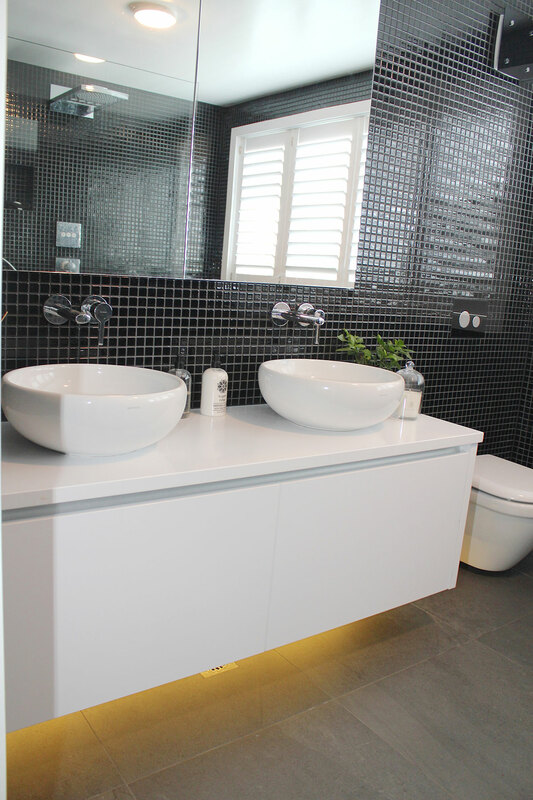 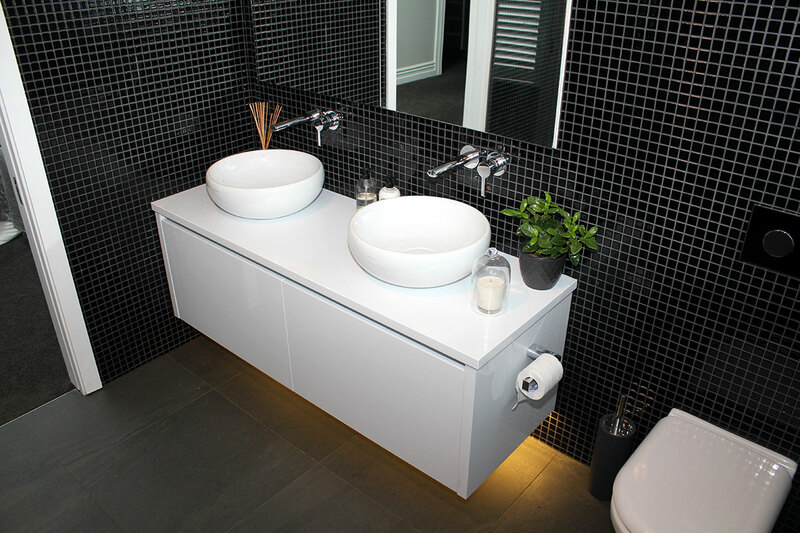 For the custom bathroom vanities we used a combination of Gloss Acrylic as well as American white oak stained, and clear-coated Corian benchtops.